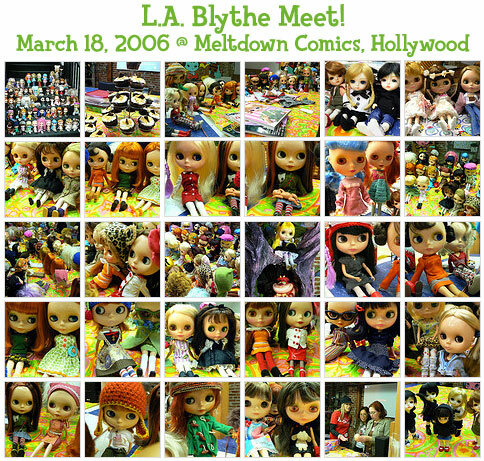 We had a super-fun time at the Blythe Meet today! Thanks so much to Jenny/SewDarnCute for organizing the meet and for the bestest cupcakes in the world! It was a special meet for me because I got to meet one of my Blythe heroes, Tess of BonBonBlythe! Hi and welcome to the xoxoBlythe blog! I've been collecting Blythe dolls since 2003. Blythe has inspired me to learn how to knit, sew, and be more creative in my everyday life. I've also met the most wonderful people because of Blythe. This is where I share my adventures! ©2005-2012 xoxoBlythe.com. Awesome Inc. theme. Theme images by Ollustrator. Powered by Blogger.